Previously, in Part 5 of this ambitious series, “NORAD and the UFO Smokescreen”, I discussed North American Aerospace Defence Command’s (NORAD) role in the identification, tracking and categorisation of aerospace activities across North America, and their sophisticated maintenance of “air sovereignty” through well-developed national defence doctrine. Within that complex framework, I demonstrated that UFO’s can be “allowed for”, and, have indeed plagued NORAD in the past. Their own records prove that. Of course, by “UFO” I mean unidentifiable objects or other unusual, solid phenomena; completely distinct from just strayed aircraft or other manmade activities. For readers who are new to this series, my entire Parts 1 through to Part 5 can be found here: Part 1, Part 2, Part 3, Part 4, and Part 5. NORAD’s surveillance mission extends into space. In this, Part 6, and an upcoming Part 7, I am investigating their monitoring of space objects – manmade, natural, or possibly otherwise; with the “otherwise” category being UFO’s. To accomplish the aerospace warning mission, NORAD is responsible for providing Integrated Tactical Warning and Attack Assessment (ITW/AA) of an aerospace attack on North America to the governments of Canada and the US. This is accomplished by using information made available by the ITW/AA system. Portions of that system are under the operational control of NORAD, while other portions are operated by commands supporting NORAD. 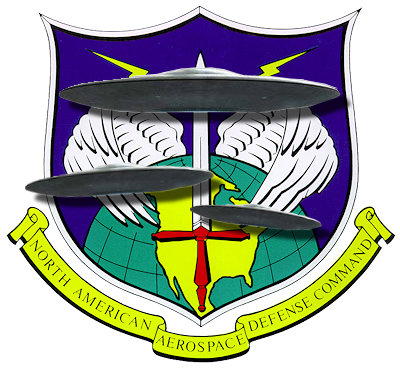 Most of the thirty sensor sites that make up the SSN are currently subordinate to the USAF’s massive Air Force Space Command (AFSPC), and, in turn, are controlled by the Joint Functional Component Command for Space (JFCC-Space), which is part of the United States Strategic Command (USSTRATCOM, or just STRATCOM). Furthermore, it is important to note that STRATCOM has only been commanding the SSN since 2002. 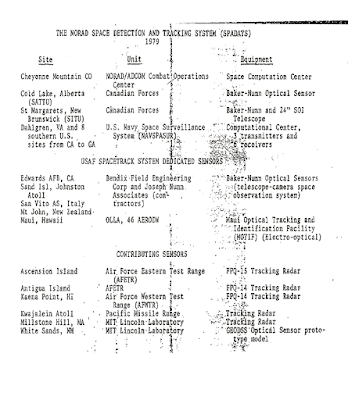 Before then, it was the US Space Command (USSPACECOM, or just SPACECOM) that controlled the SSN and – like STRATCOM today – provided the wider US military with a full suite of space object orbital data, foreign missile launch detection capability, space object decay prediction, and other final informational products. SPACECOM was absorbed into STRATCOM in 2002 in one of the biggest organisational alterations the US Department of Defence (DOD) undertaken in recent times. Both the old SPACECOM and current STRATCOM have been, and still are, comprised of the Air Force Space Command (AFSPC), the Naval Space Command (NAVSPACOM) and the Army Space Command (ARMSPACECOM). It is from this complex organisational structure that NORAD receives the data it needs to fulfill its mission. ...detect, track, identify, and catalog every man-made object in space. Along with other members of his UFO study team and representatives from the USAF Office of Aerospace research, Dr. Condon was given a briefing at Ent and an orientation tour of the Cheyenne Mountain complex. 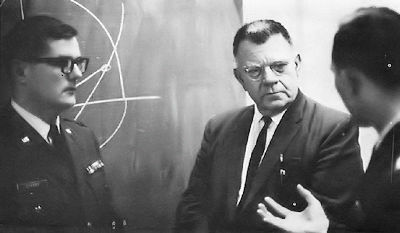 Below is a rare picture taken of Dr. Condon at the 1st Aerospace Control Squadron, Jan, 1967, from the 9th Aero’s Q Point article. There is only one surveillance system, known to me, that exhibits sufficient and continuous coverage to have even a slight opportunity of betraying the presence of anomalistic phenomena operating above the Earth’s atmosphere. The system is partially classified and, hence, I cannot go into great detail at an unclassified meeting. I can, however, state that yesterday I travelled to Colorado Springs and confirmed that since this particular sensor system has been in operation, there have been a number of anomalistic alarms. Alarms that, as of this date, have not been explained on the basis of natural phenomena interference, equipment malfunction or inadequacy, or manmade space objects. Dr. Baker’s mention of the town “Colorado Springs” is a without doubt a reference to NORAD’s Cheyenne Mountain facility. Colorado Springs and Cheyenne Mountain are only a few miles apart. This research program for a satellite inspector became known as SAINT. The program got new emphasis in November 1960 when an unidentified space object was detected by the North American Air Defense Command (NORAD). The existing ground based sensors were unable to identify the object, and a program was begun to build better ground-based and space based sensors for space object identification. As the United States attempted to improve its ground surveillance, it also started using reconnaissance satellites. Obtaining archived SPADATS records, which were created by either NORAD or the space component commands like NAVSPACOM, is very difficult. But files, of the millions of pages that must exist, have been released. 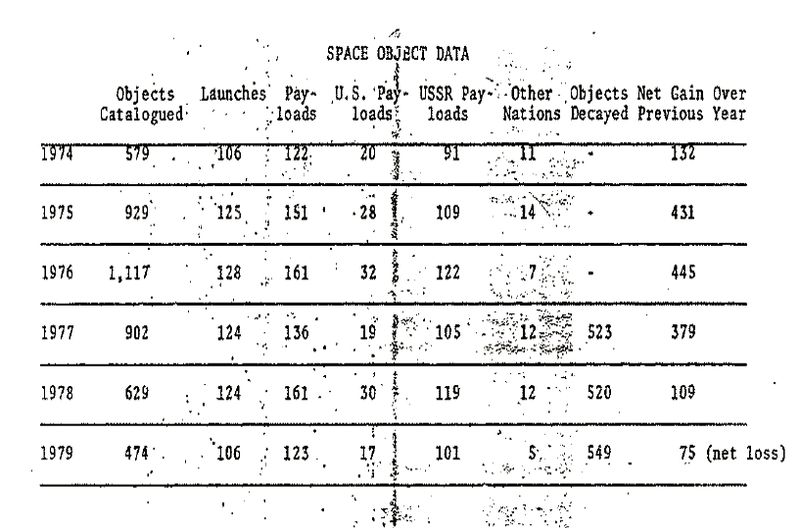 In briefing paper titled “Information on 1979 Space Activities”, Lt. Col. T. J. O’Rourke, Technical Data and Systems Division, NORAD Combat Operations Center (NCOC) tabled 6 years of “Space Object Data” for NORAD Headquarters. 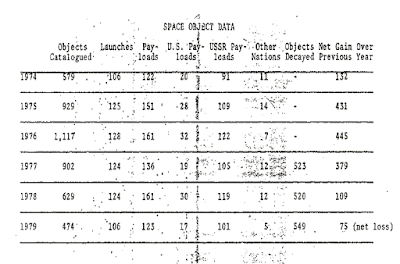 The table, comprising of data dating 1974 through 1979, is scant on detail and merely lists “Objects Catalogued”, “Launches” (detected), etc. This year, we are attempting to access, through the NORAD History Office, somewhat more comprehensive 1970’s records that relate to the above mentioned data. I have imaged the table below. 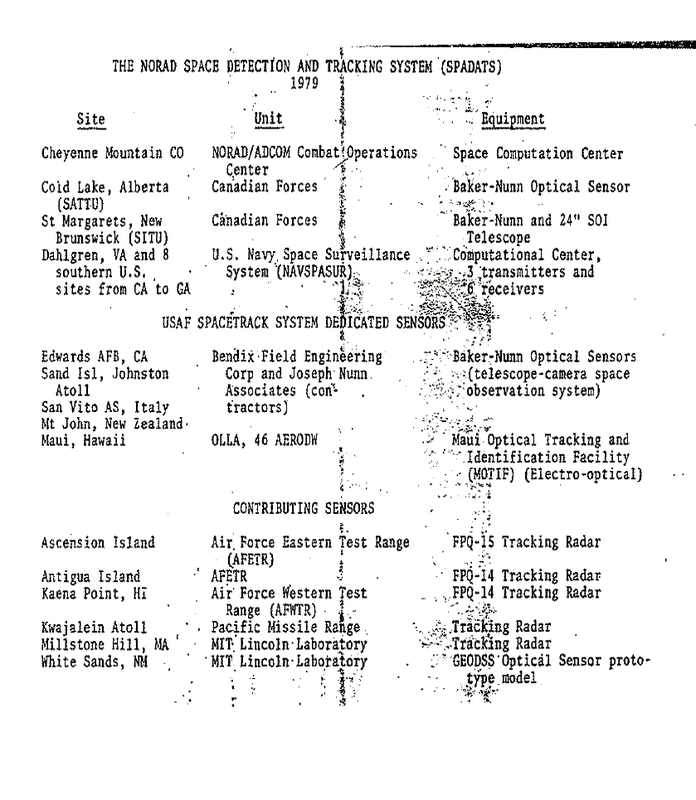 In a USAF sponsored paper titled “Military Uses of Space 1946-1991”, Chapter 2 contains a three page table of information about SPADATs titled “The NORAD Space Detection And Tracking System (SPADATS) 1979”. Originally classified SECRET, three columns are titled “Site”, “Unit” and “Equipment”. Below is the first page of the three page table. In almost every monitoring system you set up, whether for defence or scientific purposes, if you don’t want to be snowed with data, you intentionally build selectivity in…. You do not see what you are not looking for. Consequently…the fact that they don’t repeatedly turn up what appear to be similar to UFOs, whatever we define that to be, is not quite as conclusive as it might seem. Despite the breath-taking capabilities of the SSN and NORAD in the 1960’s and 1970’s, and the significant publicly available information around these capabilities, there is not a lot of evidence that NORAD was actively or deliberately pursuing UFO’s in space, unlike their much more terrestrial air defence role. Having said that, I am quite sure that had NORAD, or anyone else for that matter, watched a really anomalous, unexplainable event play out on the fringes of space – it would have been be immediately considered very highly classified, and there is nothing whatsoever to assume we would be openly able to study it now. In my next post, I will be discussing NORAD’s space surveillance capabilities into the 1980’s and beyond. I will be presenting entirely new information that has never been seen by the UFO community. Following on from then, I will refocus on NORAD’s role in air defence and airspace management – the very place we know UFO’s are being seen and studied.